Attend the Annual Meeting, Access CME courses, symposia, webinars, assessment tools, print and digital publications and more. Stay current on clinical knowledge and guidelines, practice management, industry news, and legislative issues with AAOS journals and online resources. Your dues support AAOS efforts in advocacy on many critical health policy issues facing orthopaedic surgeons and patients. Explore content-appropriate and professionally-designed patient brochures and booklets and patient-centered resources for consumers. AAOS is committed to helping you successfully manage your practice and advance professionally throughout your career. Access the rich array of resources and information the Academy offers. 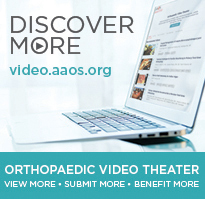 Get more from your AAOS membership. Explore the benefits AAOS offers in each of these areas.